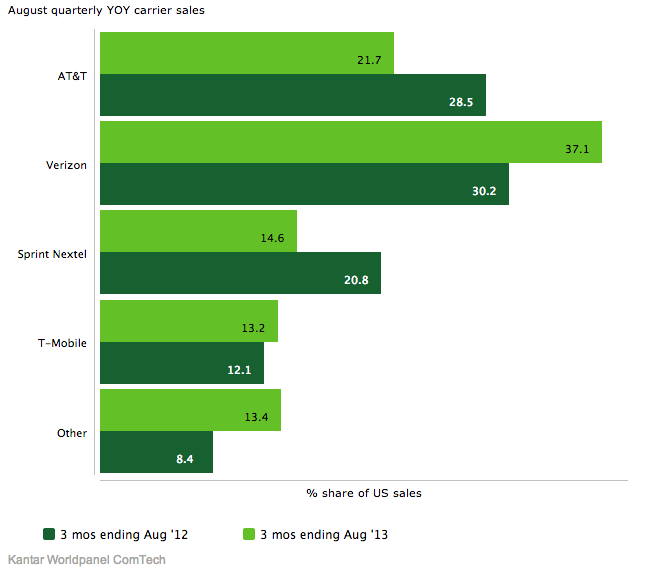 More than one out of every three smartphones sold in the U.S. this summer was activated on Verizon Wireless’s(s vz)(s vod) network, according to Kantar Worldpanel ComTech’s latest consumer survey numbers. Verizon’s share of the smartphone market jumped from 30.2 percent in the summer of 2012 to 37.1 percent in the three-month period ending in August. What’s most interesting is what accounted for that growth: the iPhone(s aapl). AT&T(s t) has long been the undisputed king of iPhone sales in the U.S., but more and more customers are bringing their iOS devices to Verizon’s network. According to Kantar, the iPhone accounted for 44.6 percent of its smartphone sales this summer up from 35.9 percent last year. Verizon was probably helped by the fact this was the first summer an iPhone supported its LTE network as well as the first year all three commercially available generations of the iPhone worked on its 2G and 3G systems. Meanwhile AT&T is still selling iPhones like crazy – it accounted for three out of every five smartphones it sold this summer – but the carrier only handled 21.7 percent of total U.S. smartphone sales, down from 28.5 percent in the summer of 2012, according to Kantar. Though Kantar didn’t release exact volumes, these shifting percentages would indicate that Verizon is quickly catching up to and may even have surpassed Ma Bell in total iPhone volumes of late. Verizon also took market share away from Sprint(s s), which saw its claim on the smartphone sales drop to more than six percentage points to 14.6 percent. The only other major carrier Kantar found showing improvement was T-Mobile(s tmus), which increased its share from 12.1 percent to 13.2 percent. T-Mobile officially landed the iPhone this spring after years of being snubbed by Apple(s aapl), but it also launched several aggressive pricing promotions before or during the summer, which could explain increased sales across the OSes. Kantar also found that Apple regained some of the share it lost in what is typically a slow period before its annual iPhone refresh. iOS devices accounted for 39.3 percent of all total smartphones sales this summer, up from 33.9 percent, while Android fell from 60.7 percent to 55.1 percent of the total. 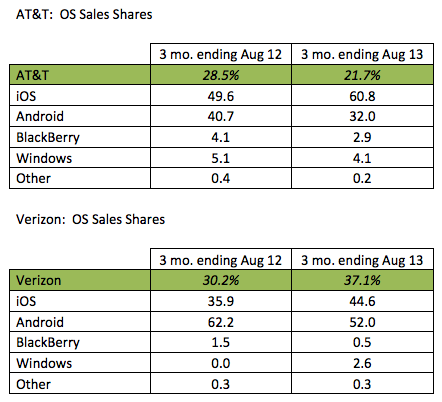 BlackBerry(s bbry) sales continued their decline, while Windows Phone(s msft) devices saw an uptick. that got drowned out by all the negative an speculative comments, and being rolled out now, to be available in time for the Christmas selling season. Dare to ask BB for their rollout schedule or plan, or open your eyes to do some non-USA-made gear evaluation, trial and buying? a 2830 mah battery and other new features. Quite interesting data from Kantar, but if that was the trend in the summer it completely shifted with the introduction of the new Iphones 5s and 5c, according to Localytics. They are tracking Iphone activations since Iphone introduction on September 20, and their numbers suggest AT&T is selling/activating a whole lot more Iphones than second place Verizon and Sprint and T-Mobile. If you do the math, AT&T share is above 50%, Verizon 35%, Sprint 9% and T-Mobile 6%. Your headline says t-mobile’s share shrank! Might want to fix that. What’s most interesting to me is that T-Mobile didn’t do better with their new pricing. It’s not surprising, because it’s not that great of a deal, but it is interesting. Clearly they need to make it a better deal for those who don’t frequently update their phones. Tmo’s issue is their coverage. Once you get out of a major metro area their coverage is just not that great. Especially their LTE coverage. I’m hoping they do improve their coverage so they can put some pressure on VZ and ATT. I would agree, because that’s the exact reason I don’t have a Google Edition Galaxy S4 and instead have Verizon’s version. I think they did quite well considering what they’re up against. Kantar has found that T-Mobile’s smartphone sales have been declining until now, so they’ve managed to reverse a trend and bump up their share a percentage point. Remember Verizon and AT&T are both nearly three times larger than T-Mobile. If T-Mobile continues to take 13 percent of the smartphone market it would be holding its own Verizon and actually beating AT&T when it comes to smartphone sales against its subscriber base. This is just one survey over one summer, but it looks like T-Mobile did some damage against AT&T and Sprint over the summer. It just didn’t do as much damage as Verizon.